Once again, I'm taking my chances on a wayward adventure cycle; however, this time I'm journeying to a place I just recently returned from. Guatemala. Today was orientation here in Dallas and all the teams going to various corners of the world (China, Kenya, Romania, Latvia, Russia, and Peru) came together to pack bags with humanitarian aid and learn about the rules: no drinking, no skimpy clothes, no fraternizing with each other... I'm screwed. About 3 hours after my mom dropped me off, we'd finished orientation and the next step was to go to the Buckner International warehouse and sort some shoes that had been donated from various charities and food drives across the country. They all get brought to this massive compound where then then have to be sorted by volunteers like myself and 24 others (1 guy). The dude that was charged with giving us the run down of the operation was into making annoying, almost chauvinist observations. Like he was telling us what we had to do and he looks around for the one guy in the room and says "Where's my men? There you are! No, you cannot drive the fork lift." I looked at him trying to see if he was joking, but he really did assume that a boy would be the only one capable/interested in the machine. Then he continued giving him tasks meant for "men" like operating the hand held fork lift and assigned us to the (I guess more feminine) task of sorting at 8 refrigerator sized boxes of children's shoes. All shapes, sizes, colors, and fabrics. That was a bit irksome since 24 of us were getting in each other's way crammed in between these boxes while the lone ranger waited for us to fill up boxes so that he could cart them away in between doings of nothing. To be fair, his singularization which wasn't his fault, but it was dude's fault for not delegating outside gendered notions of ability. I asked if I could help out the guy on the little fork lift, but he stammered and stuttered until I just went on with my life. The shoes were sorted in record time and my deoderant was put to the test in the 100 degree Texas heat and humidity. For some reason we were sorting innumerable shoes in a tiny space in the ONLY room with absolutely no A/C and a fan blowing towards us desperately from 200 feet away... so odd. Hundreds of Crocs, a few Ug boots, and a million flip flops later we were ready to go back to the main office and get some dinner. The other people in my 10 person crew are pretty cool. Again, there's only 1 dude, but he seems to be able to handle himself. Quiet. Respectful. Probably around 21. No risk. Some have been on many mission trips before and almost all have some education in childhood education or speech pathology. Speech pathology is a pretty rampant degree amongst the people here, including my leader Erin. Erin is cool. She gets me and thinks I'm funny, which are essential qualities I search for in a friend. Perhaps its because she is a teacher to special needs kids, but she knows well how to control a room. Not with any stern-ness or an aggressive attitude; on the contrary, she's just a nice gal who knows what she wants and how to get it simply. 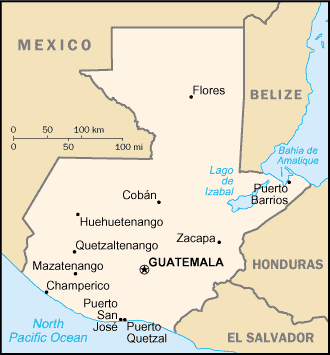 So, tomorrow I will be embarking upon the long series of connecting flights to Guatemala City and from there I will visit a few of the cities listed on the map above, including: Heuheutenango, Zacapa, Guatemala City, and Antigua which is not shown but is only 30 minutes SW of Guatemala City. So follow me and I'll try to write as much as possible with many pictures!